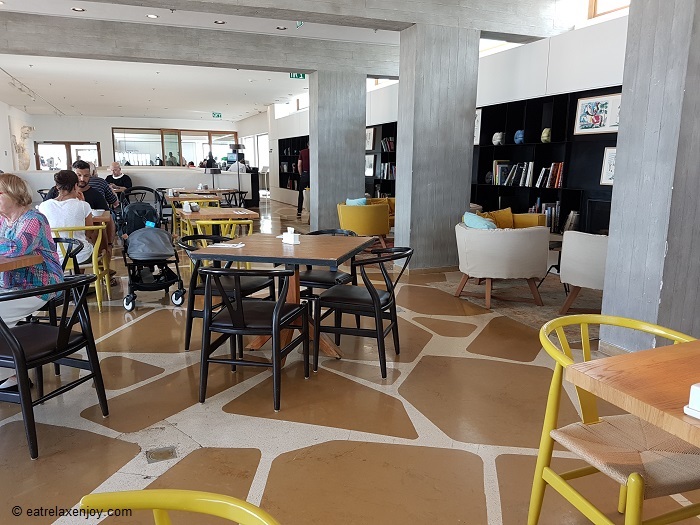 Elma is a hotel and arts complex in Zichron Ya’akov which has a unique architecture in a preserved building functioning as a living museum with art exhibits and concerts halls. 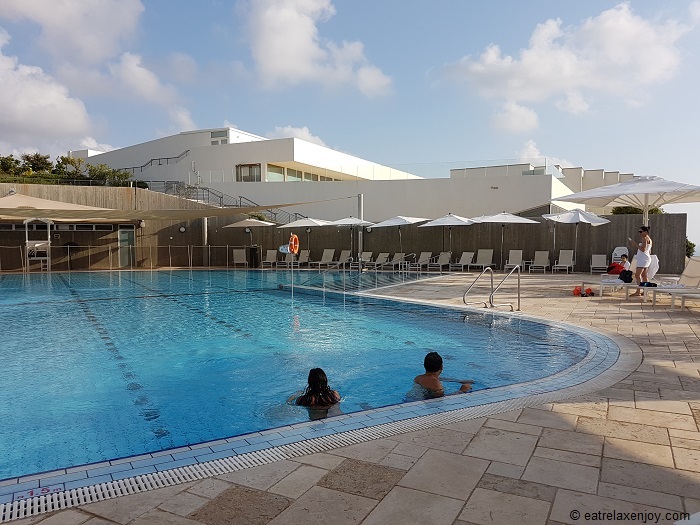 Elma is a luxury hotel with two swimming pools and spa, and green grounds featuring stunning views of the coast plane with a great summer breeze! ELMA stands for "Elstein Music and Art". 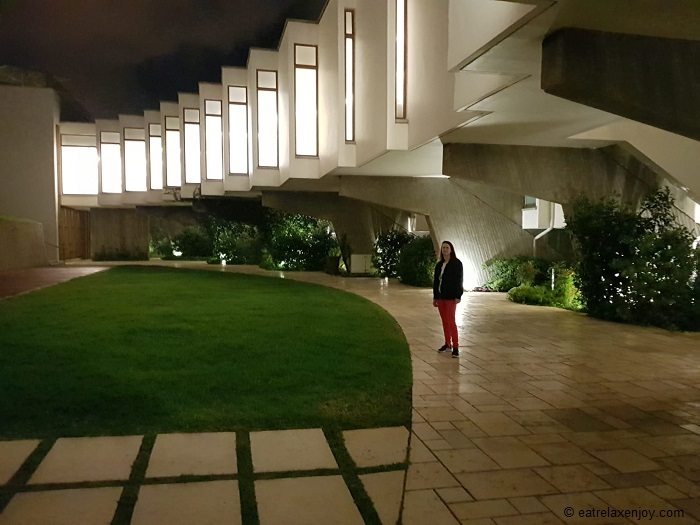 It was established in the restored iconic building of Mivtachim Convalescent Home that was designed by the architect Ya’akov Rechter who won the Israel prize in 1972 for its design. 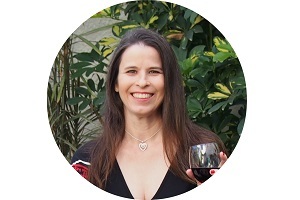 Lily Elstein bought the building that was doomed to be demolished and in a complex and expensive effort that took years, she restored and refurbished each and every part of it while reserving the qualities of the original architecture such as reproducing the original floor design. The building has an extraordinary architecture - it merges into the shape of the mountain, has large openings and windows that allow natural light into the building and some unique shapes. The restoration included conservation and restoring of original aspects with modern style. The hotel is like a museum with artwork everywhere giving stage to Israeli artists. The décor is also modern and spectacular. 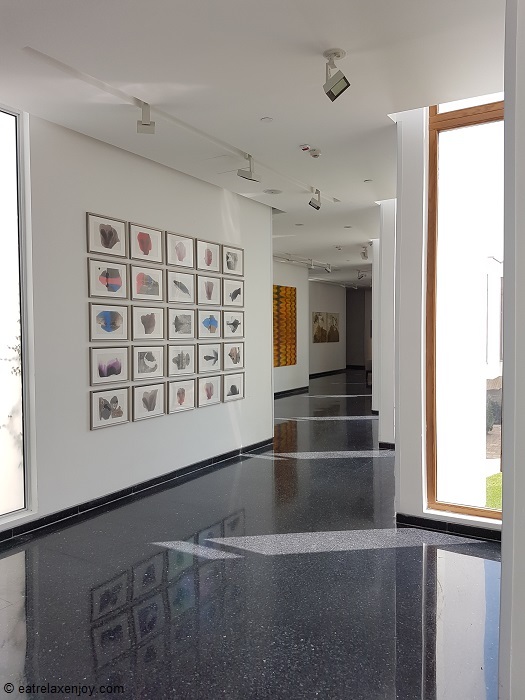 The area of the rooms’ corridor is a changing art exhibition of local artists. In the upper garden there is a modern art exhibit in a box. We took time to roam around the building exploring the architecture and artwork. 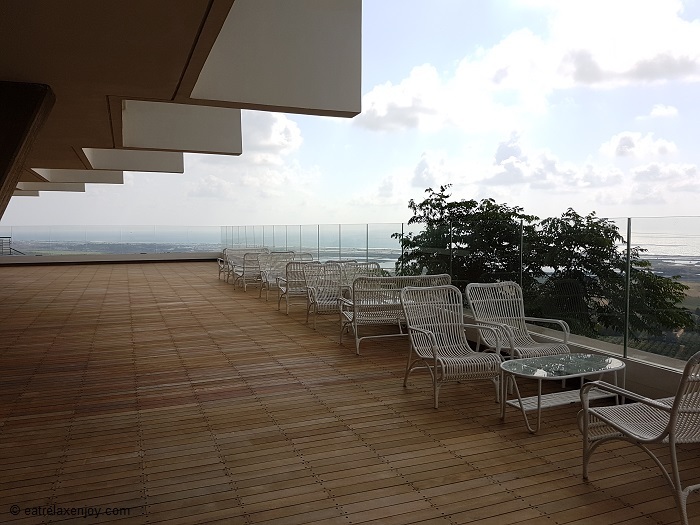 The grounds have a groomed garden and a mountain edge promenade romantically lighted at night and there are many quiet corners and terraces overlooking the wonderful view. The weather is always pleasant here in the summer evenings because of the higher elevation and the breeze coming from the sea. 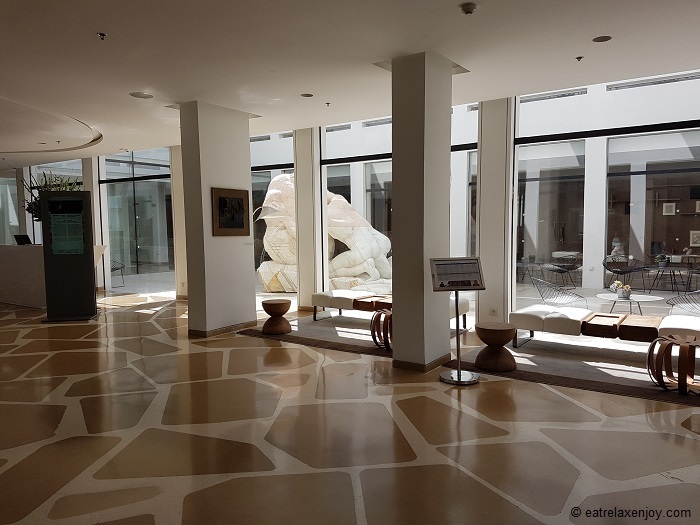 Every day there is a guided tour of the hotel grounds that gives an overview of the history, architecture, artwork and vision of the ELMA complex. Elma has 2 musical venues: the Concert Hall and “the Cube”. 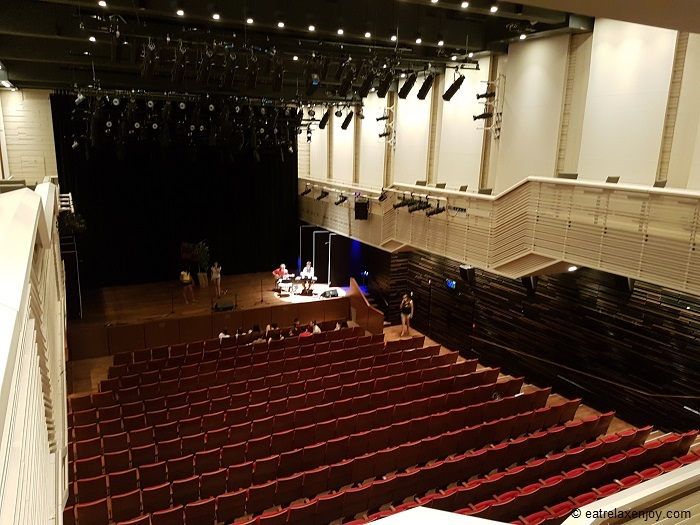 The Concert Hall is a modern 450 seats special acoustic performance hall featuring a moving stage and an under-stage orchestra space. In addition to all the state of the art features it has a 1,414-pipe organ worth 420,000 Euros and two Steinway Model D concert Grand pianos. 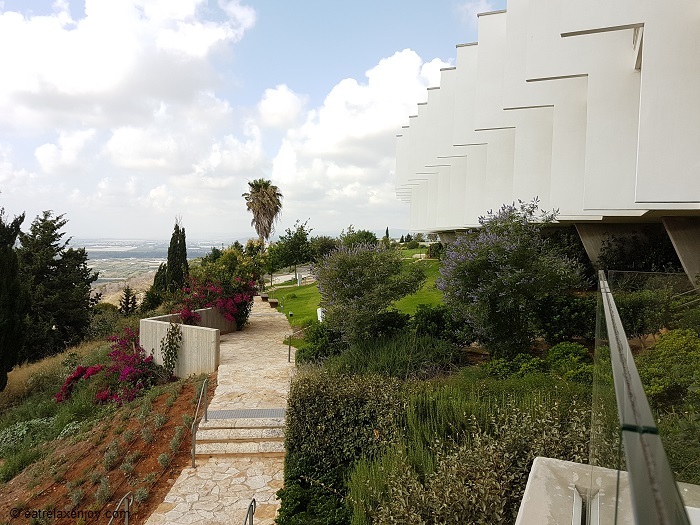 Israeli and International artists play here on a regular basis and many productions such as operas and classical concerts are staged here. 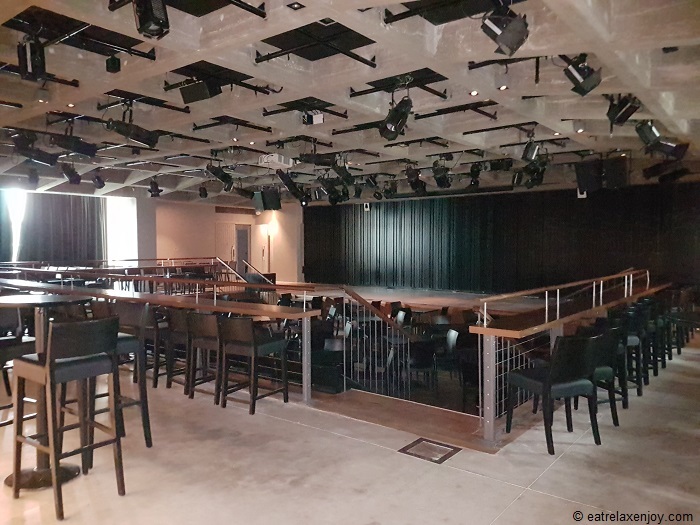 In addition, “the Cube” is an informal performance hall with 150 seats with an inside bar. Almost every day various artists play here, and they give stage to young artists. At the night we stayed at Elma we enjoyed a jazz concert of two talented beginner female artists. The schedule of performances and concerts is available on Elma’s website. 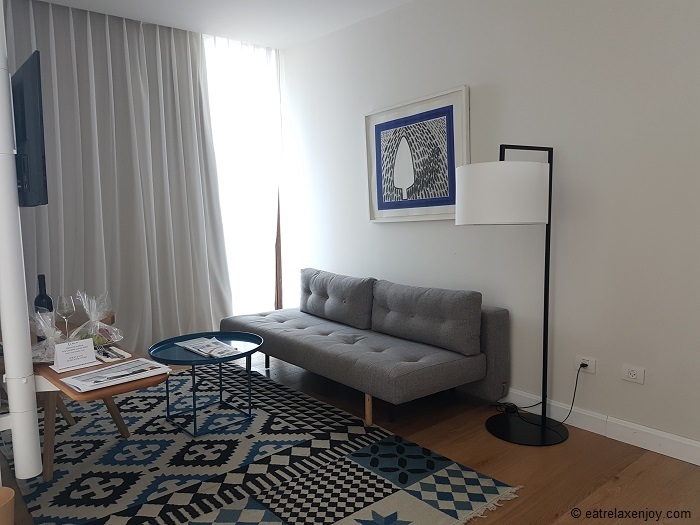 Elma’s hotel rooms are spacious and beautifully decorated with artwork. Each room spans over two of the older rooms and is like a studio suite with two balconies and a large bathroom. 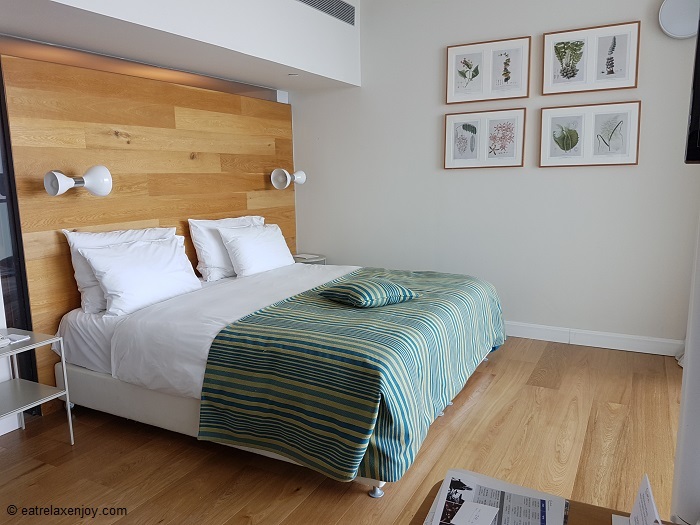 One part is where the bed is placed – facing the open view! In the other, there is a small living room with a sofa and a desk, and a coffee corner with an espresso machine. The floor is wooden and there is a closet with a large safe deposit box. The bathroom is separated by glass doors – shower and toilet, leaving a large area in front of the mirror and basin area. We were slightly disappointed that there is no full bath here, but were so busy in the spa that it did not bother us eventually. We were so happy in the room. 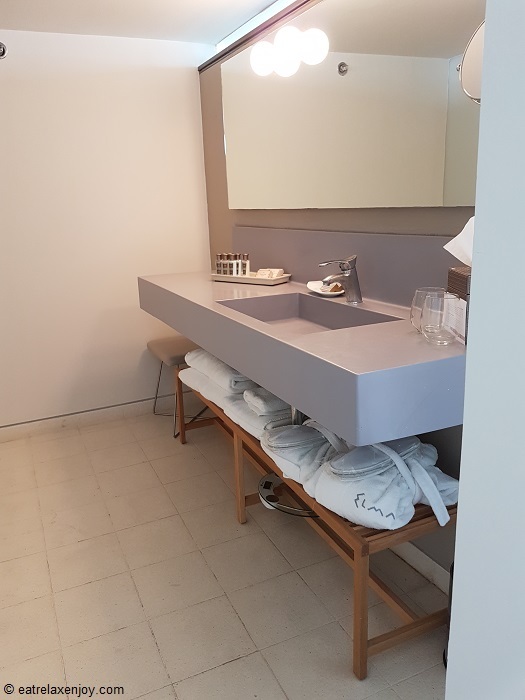 The bed was very comfortable, the water flow in the shower was strong and we indulged with the Israeli fashionable Sabon toiletries, especially the shower oil. Everything is controlled here electronically – central lights control and climate control. 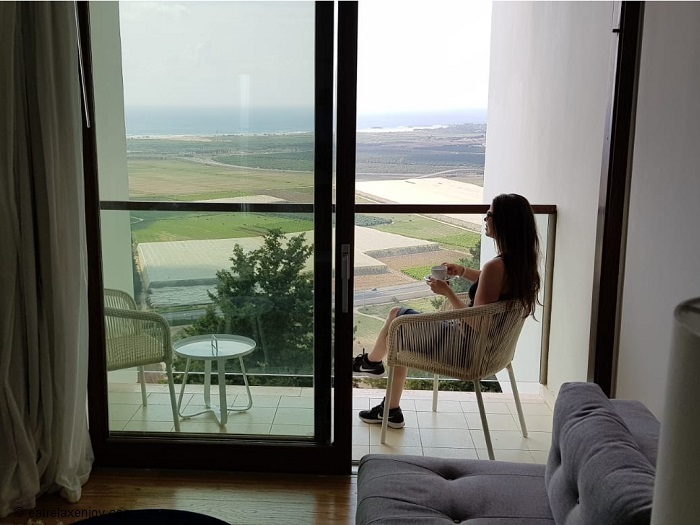 We sat to have an afternoon tea on the balcony of the room that was facing the coastline and the sea breeze was remarkable! It was a pleasure and so serene! The way the structure is built gave us ultimate privacy! The hotel also has suites and villas. Elma has two swimming pools and a spa. 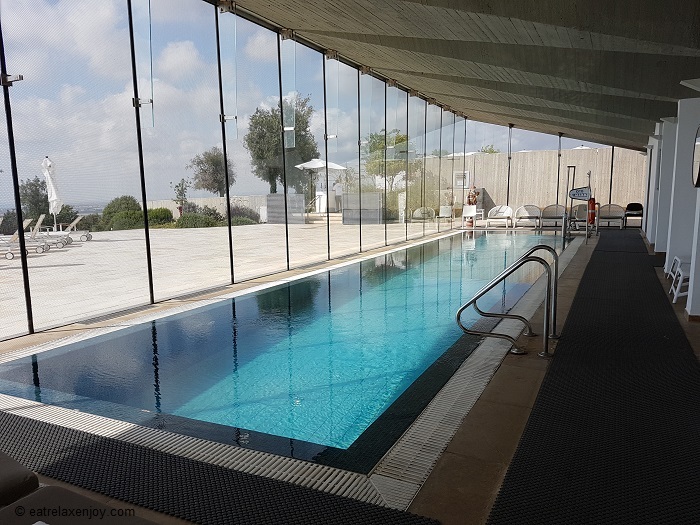 The external seasonal pool is very large and relatively shallow with a deck-edge. It was open already for the season when we stayed there and the water were surprisingly warm and pleasant. I was able to swim laps as the middle of the pool had lanes marked and it was around 25 meters long. The pool is surrounded by sun beds and has a great view of the coast plane all the way to the Mediterranean! The Spa has a small but relatively lengthy deck-edge heated pool that is open year round and allows some laps swimming. 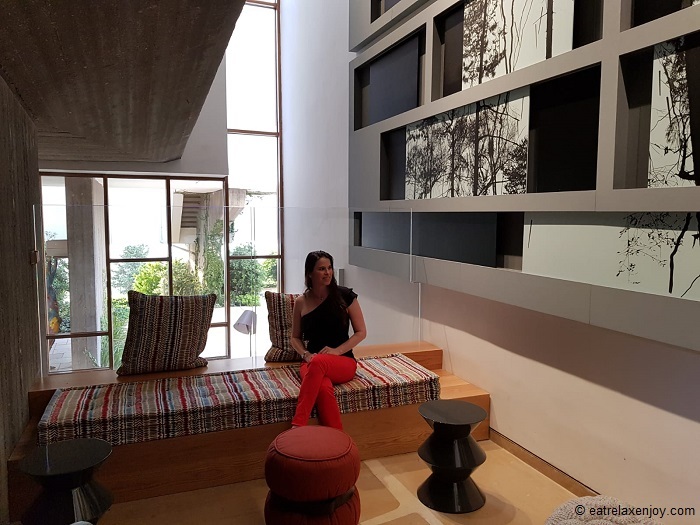 It has glass walls and it is stunning to sit there! There are also a large Hamam and spa rooms offering body treatments. And there is also a well-equipped gym which we haven’t had time to try. Like everything else in Elma, the main restaurant has a unique name and décor. The name, Oratorio, is borrowed from the music world - it is a large musical composition. The décor designed by Baranowitz Kronenberg is shaped to encourage social interaction. 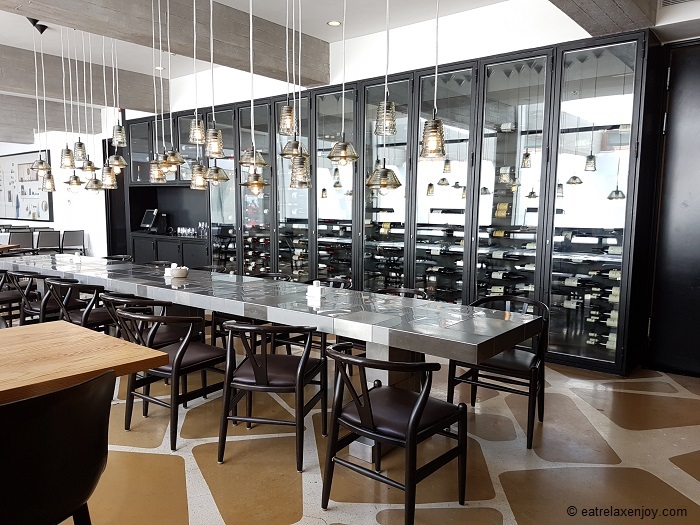 Oratorio is elegant; it has a library and a glass-doors 700-bottle wine cooler featuring local wines from the area and spanning over the internal wall of the restaurant that also has an open terrace. There are different seating options for couples, families and groups including bar area and large tables. The restaurant emphasizes fresh, quality local ingredients with a Mediterranean touch. We had dinner and breakfast at the restaurant. Dinner has a set menu for a fixed price that includes a self-service antipasti bar. The main courses and desserts are selected from the menu and are served to the table. Since we were in Elma during the middle of the week and there was relatively low occupancy, the antipasti bar was rather small. 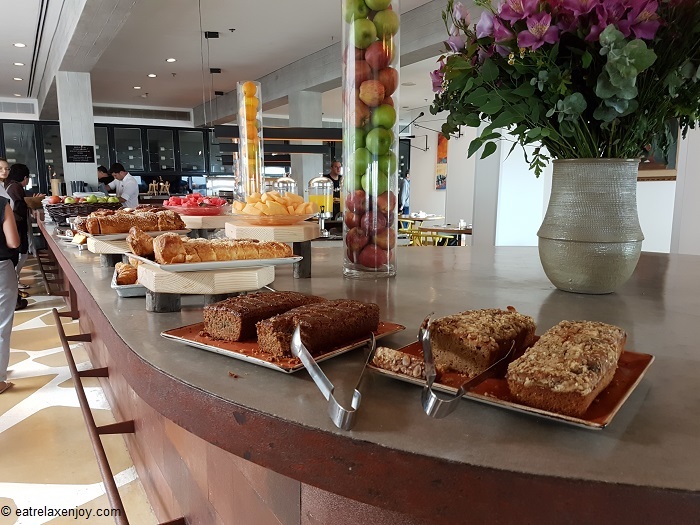 When I say small, the selection was enough and it was just like I like it – less but best – each and every item served there was no less than excellent! 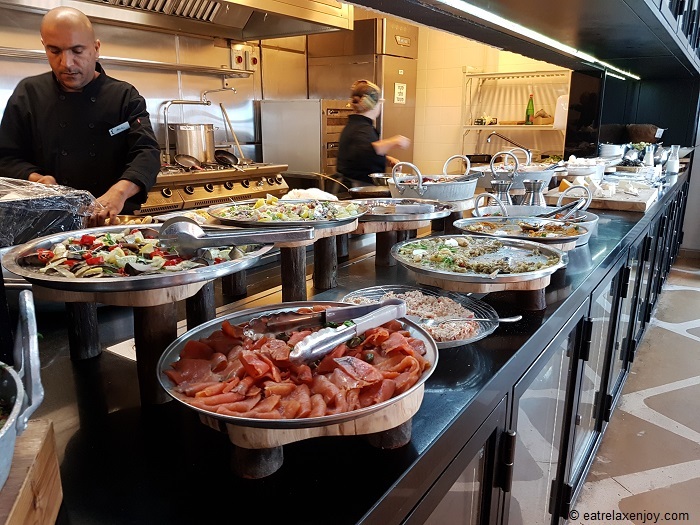 The bar included many different antipasti vegetables, mushrooms, eggplant, smoked salmon and quality cold cuts, dips and a variety of fine breads. The main courses menu had a good selection of dishes including different plates of meat, fish and vegans. We both ordered Beef Filet, which was exceptional, especially taking into consideration that it is kosher. It was served on 5 creams of vegetables, which was tasty and beautiful like an art creation emphasizing the location’s theme. From the selection of desserts we picked a variation of Alfajores and a chocolate net. The latter was superb! Breakfast was buffet-style. It was one of the best breakfasts I have eaten in Israel. The variety of vegetables, antipasti, warm dishes, healthy choices and desserts was exceptional! Everything was so tasty that I couldn’t decide what to eat first! We also had freshly squeezed fruit juice and fine coffee. 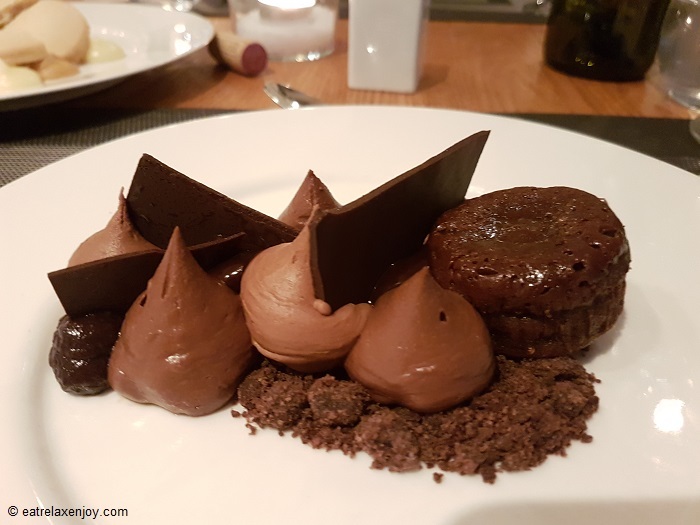 The relatively new chef Ohad Levi does a really good job here and they serve high-quality food that looks and tastes excellently. 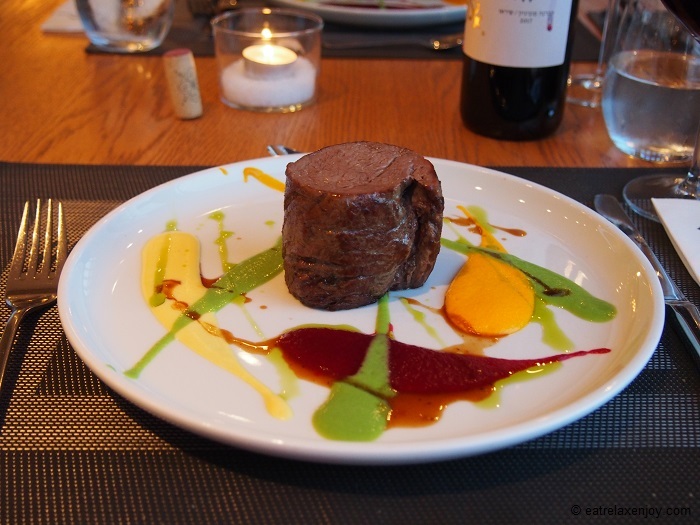 Oratorio operates as an independent restaurant, welcoming visitors from outside the hotel. 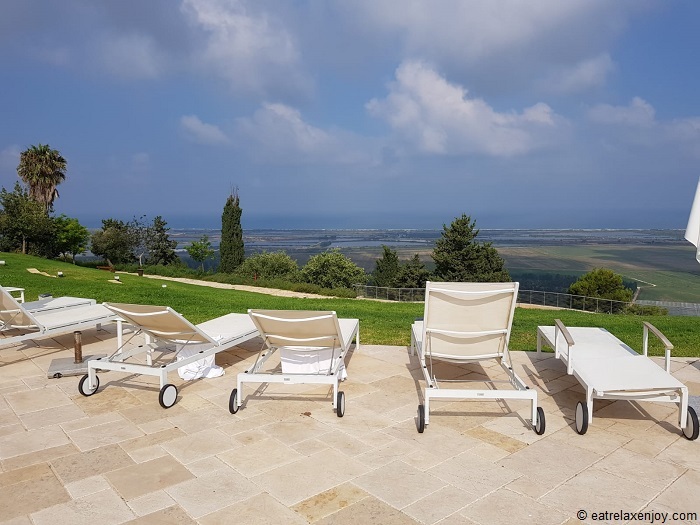 The area of Zichron Ya’acov is rich with attractions and wineries, but there was so much to do in the hotel in term of sports, culinary, arts and music that we did not have a reason to leave the hotel. However, if you plan on a longer vacation, you can take advantage of it. The prices for a double room at Elma start from NIS1200 midweek, and NIS1950 on weekends, breakfast included. During July-August the third night is free. Hotel guests receive 10-50% discounts on concerts.